Welcome to the official thread of CL11-Qualifier 2. 1) [Blitz] - https://www.warzone.com/Clans/?ID=20 , Veteran clan, starting again from qualifier. 2) Discovery - https://www.warzone.com/Clans/?ID=346 , Casual cousin of FCC, debutant. 3) HAWKS - https://www.warzone.com/Clans/?ID=174 , Winners of CL10-Division D.
4) Nuke Diplomacy - https://www.warzone.com/Clans/?ID=372 , Debutant. Instead of individual games created by CLOT or manually, this will be conducted as set of tournaments. There is a schedule for this (given below) and there is a time span of 12 days for joining the tournaments. Tournaments will be created through this account only and I will be mailing the participants through this account; don't join tournaments with similar names created by someone else or by someone imitating the tournament creators or TBest. Double-check things before you join and also check the settings. Mails regarding joining the tournaments will be sent to participants 3,7,12 days after creation date and to clan managers after 7,12 days. In the event of failing to join by 12 days, the tournament will start without that player/team. Also while joining team tournaments, make sure players representing their clan join the same team and not join different teams. 3rd		Wizards		  47	  079		  Third place? If you feel like something isn't done correctly and if there is bias from me, contact TBest, Math Wolf and The RiverStyxie. -Clan managers are in charge of managing the substitutions and players. Pay attention to games to avoid boots, nonjoins, etc, or it could cost you valuable points. -The tournaments will have 12 days to join from the creation date and irrespective of creation date moved up or down, the time to join is the same. 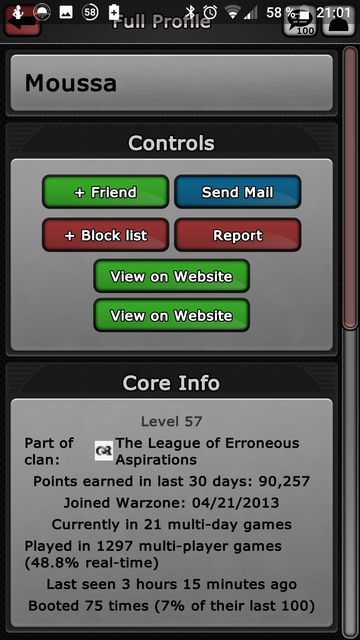 -It is prohibited to get help or advice in a Clan League game from any player who is not playing in that game. If this happens, both parties are considered to have transgressed and be subject to potential sanction. -Every clan can replace 6 slots (out of 18) over the course of the season. Remember that for Q2 each player is allowed a maximum of 2 slots. Make sure to not go over this slot limit and pick the player from the roster while making a substitution. -If a player represents 2 slots, they can be partially replaced and continue to play some of the slots as well (i.e. substituted in some, but not necessarily all of their slots). If a clan has used all 6 substitutions over the season, it cannot make any further ones regardless of the circumstances. -Do not take control of a retired player's account to save their current games. These games should be forfeit as a penalty for retiring the player. -In the event of a substitution, the on-going games for the retired player will not be remade. Only games which have not been created will be allotted to the substitute. Both players will use up a slot once the tournament has at least one game created. A substitution can be carried out by the CL staff. We will guarantee the substitution within a maximum of 3 days. Any new games created within this 3 day period for the retired player may be forfeit as well. -Since it is in tournament format, I request the clan managers to make substitutions before the tournament starts. If in case of substitution after tournament starts, post it here-so that players know this and the games, created after the substitution-with player who has been subbed out will not be considered towards points and will be remade individually with player who has been subbed in. Avengers substitution: Fairplay Boy ( https://www.warzone.com/Profile?p=8288678225 ) in and Sakata Gintoki ( https://www.warzone.com/Profile?p=1388752514 ) out for Tournament name (tournament link). Substitutions used so far: 1. The links (profile and tournament) and the number of substitution used so far are optional; this has to be done 3 days in advance of the required substitution. -It is also recommended that you mail me and TBest, so that the substitution is made within 3 days for sure. Games with subbed in player/team will be created by myself and again, make sure to check (game creator, settings) before joining. -Players will be given a warning after 3 days, 7 days and 12 days the tournament is created,if they've not joined it. At 7 and 12 days a warning will be sent to the Clan managers. If the players haven't joined by 12 days time or have declined the tournament, it may result in auto-losses and will cost substitution(s) to replace the non-join/declined player(s). Good luck to all participants, join tournaments on time and have fun. Looking forward to it. This will be tough with Blitz in this group. But ambitions are high. Wish you all luck and, most important, have fun!! I kinda love that troll doesn't know the number six and decided this division has 8 clans now. In the event of a substitution, the on-going games for the retired player will not be remade. Only games which have not been created will be allotted to the substitute. Both players will use up a slot playing this tournament. Just for clarification: when I substitute a player A with player B before the tournament begins. Do both players use up 1 slot then? I ask because player A actually never is 'playing this tournament'. Due to pending line-ups, the start is delayed. Will create the tournaments, once all line-ups are in. Gotten 2 lineups so far today, still/only waiting on LEA. I have sent them a reminder. If they don't get back to me soon, I will request the tournaments to be made and LEA players will have less time to join. Lineups have been posted for Q2. Sorry about the delay. After a small delay, the division has started and first three tournaments have been created. lol so did all the masters join blitz rather than play in division a? Not sure how much exactly, if players in Blitz had 5(or somewhere near 5) more points, they would have got Masters spot in A. Check if all players in tournament are active and haven't gone inactive. The tournaments will start tomorrow. Ask him to join the tournament before it starts (7 hours from now). Due to a small confusion of zaky declining the tournament and then joining back when a substitution was made, there are now two players from USSR clan in 1v1 Strat ME WR tournament. Because of the substitution made, games played with Eóinob alone with contribute to the points earned. And yeah, mod will go 7-0 and will get 18 points for Blitz. He is already 3-0, looking to end this tournament today itself. All three tournaments (1v1 Strat ME, 2v2 FE and 3v3 EU) have started and good luck to all participants. The next batch of tournaments (1v1 British Raj and Hannibal at gates) will be created tomorrow. With many Master clan players playing for Blitz, they're clear favorites to win the division. Second place maybe swinging back and forth between Wizards and HAWKS, but it really doesn't matter. As long as a clan gets into top 3, they will goto Div.C. Positions 4th-7th depends on how well these 4 clans perform against each other. If they're going to be ranked, it will be LEA and Discovery for 4-5 and USSR and Nuke Diplo for 6-7. New batch of tournaments have been created. Last 12 hours before the tournament starts. Mr Pink has to join or Nuke Diplomacy have to make a substitution. If not, they may be receiving few or all auto-losses. I will make an update tomorrow. The player Moussa was last seen 3 hours ago so his profile tells. But he just made his turn a few minutes ago. His playing time tells also he made the last turn after exactly 3days. He did not changed into AI. So the question is.. 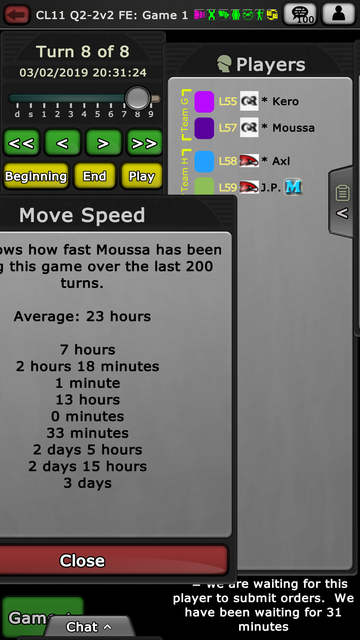 When the turn was not from Moussa's profile. And it was no AI. Were it aliens? Is this a Warlight bug? for MD games, if you had made moves beforehand, it gets saved in server and if you don't commit by boot time-the saved orders gets executed.